Union Street Players (USP), Pella’s award-winning community theatre, welcomed Spence Ver Meer into the USP Walk of Fame at the group’s annual Awards Night October 8th. Approximately 50 people attended the festivities at Central College’s Graham Annex. Since 2008, USP has met annually to honor long-time members who have gone above and beyond in contributing to the community theatre’s success. Each year an inductee is chosen by the USP Board of Directors. General criteria for nomination is ten or more years involvement, contribution in multiple roles (actor, director, producer, Board member, and etc.) and contributing to the furthering of USP’s mission. USP President, Tom Vander Well, once again served as Master of Ceremonies for the festivities. He summarized what was another successful year for USP, including The Lion, Witch, and the Wardrobe which became USP’s highest attended holiday show, USP’s middle-school theatre experience with Tom Sawyer, and another record setting year for USP Drama Camp. The group then enjoyed a year-in-review video. Vander Well also introduced Spence Ver Meer as this year’s Walk of Fame inductee, citing Spence’s faithful involvement over 20 years. While Ver Meer is most notably remembered by audience members for his multiple turns as leading man crooning Broadway favorites in popular musicals such as Sound of Music and South Pacific, he also served as Director (Pirates of Penzance, Our Town), keyboard player (Vintage Hitchcock), and Board President. Vander Well also celebrated Ver Meer for his limitless creativity. That creativity was on full display during the remainder of the evening. In Ver Meer’s acceptance speech Spence kept the crowd in stitches as he recounted the many women he’s kissed on stage, and the fact that most of them were never seen on stage again. After his induction, he joined with fellow members of Pella’s fledgling improv troupe in performing several improv games for the evening’s audience. In acceptance of the Walk of Fame honor, Ver Meer gave kudos to the many directors and fellow actors he’d worked with through the years. As the evening’s audience enjoyed dessert, they enjoyed the improv performance from improv troupe members Kathryn Andringa, Lynn Cutler, Denise Gregory, Kathy Haug, Stephanie Lantz, along with Spence Ver Meer. Union Street Players, Pella’s award winning community theatre, is proud to introduce Spence Ver Meer as our 2016 inductee in USP’s Walk of Fame. Instituted in 2008 to honor individuals who have contributed to the success of Union Street Players, the Board of Directors chooses an inductee each year. General criteria for induction include over ten years of participation, contributions in multiple capacities (acting, directing, serving on the Board, and etc. ), and assistance in furthering USP’s mission. Spence becomes the 12th member of the Walk of Fame. Spence’s first credited for USP was over 20 years ago in 1995’s The Man Who Came to Dinner in which he played the role of John. Since that time Spence has contributed both on stage and off. Local audience members likely remember Spence for his beautiful voice and lead roles as Captain Von Trapp in Sound of Music (1999 and 2009), and Emile DeBecque in South Pacific (2004). Spence most recently played four different characters in Almost, Maine this past April. In addition, Spence has served as Director (Pirates of Penzance, Our Town) and was President of USP’s Board of Directors in 1996 and 1997. Spence will be honored at Union Street Player’s annual Award’s Night, Saturday October 8th, at the Graham Annex on Central College’s campus. Please stay tuned to Union Street Players website (www.unionstreetplayers.com) or Facebook page for more details. Union Street Players, Pella’s award-winning community theatre, held our annual picnic and year-end meeting last night at West Market Park. For several years our group has held a potluck picnic in August to celebrate the end of our fiscal year (Aug 31), renew memberships, and elect our Board of Directors for the coming year. It was a gorgeous summer evening and everyone enjoyed the food and socializing. Outgoing USP President, Cyndi Atkins, presided over a brief meeting and shared an annual recap of our group’s 2015-2016 fiscal year (full text below). Treasurer Wendy Vander Well handed out a Treasurer’s report showing a positive fiscal year balance through the end of July. Pati Van Zante shared a year-end report on the USP Costume Shop. Cyndi then announced that this year’s inductee to the USP Walk of Fame is Spence Ver Meer. An October 8th awards night is planned at Central College. Congratulations to the cast and crew of The Lion, the Witch, and the Wardrobe which delighted audiences with a spectacular wintry set and wonderful costumes. Kudos to director Deb Linn and assistant Cody Kooi for a record-breaking show. The 1,615 audience members over the seven show run was the largest recorded audience for a non-musical holiday show! The choice to open the show on the Sunday of Thanksgiving weekend was a good one. 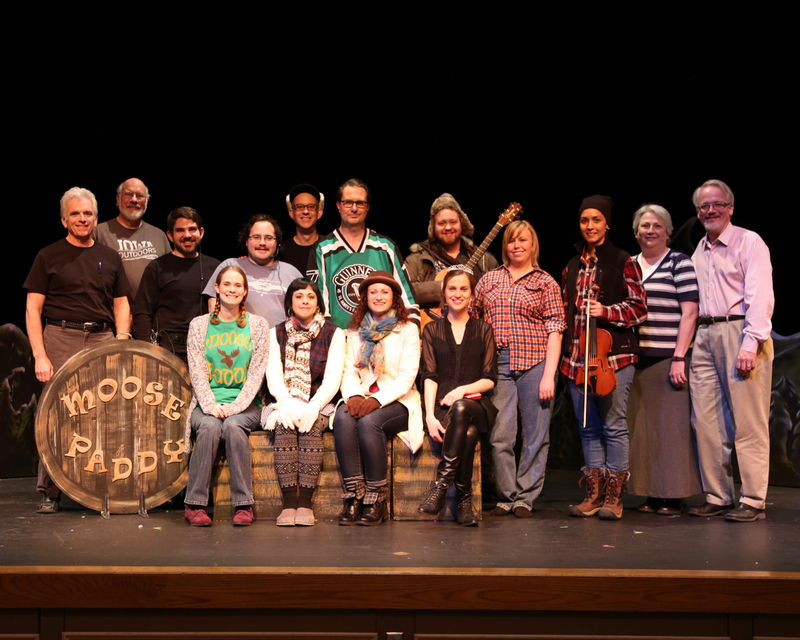 This spring, we welcomed new director Kevin McQuade who brought Almost, Maine to our stage. The show was set in the depths of winter on a moonless night in northern Maine. It’s a chilly, snowy setting and much of the cast, costumed by Linda McQuade, spent their time on stage sweating in full winter regalia. The seven cast members delighted audiences with the script’s nine vignettes which produced both laughter and tears. Our summer show, Sabrina Fair, was sadly cancelled this spring. With only 14 roles, it was disappointing to have only half that number try out. And even with recruitment, we were missing some key actors. But summer has not been quiet on the set at the Community Center. The Middle School Theatre Experience led by Cody Kooi and Deb Linn brought 20 students to direct, produce, costume, run lights and sound and act Tom Sawyer in early June. Students were selected on a first-come, first-served basis in early May and then began meeting weekly to discover how a show goes together. The experience ended with a weeklong production schedule where all the pieces were put together before two performances at the end of the week to a delighted audience of family and friends. Later in the summer, drama camp opened at the Community Center. The camp, under the leadership of Brystal Hopkins and Suzi Jones, continues to be immensely popular – filling just three days after it opened. Another grade school session was added the following week. In addition to the two grade school sessions and a junior high session, an alumni camp was a popular addition this year. Over 120 children celebrated life in the theatre during the drama camp weeks. There are many other items that I could report, but I’m going to stay with some minimum things that we should have on file. For example, our current checking account balance is $59,842.01 and I would ask our treasurer to present her report. And our Costume Shop report was emailed to members earlier and again a final report will be given in September, but I do want to call out two remarkable things: our rental income was $4,491 during 2015-16 and we received an amazing $17,723 in community donations this year. What a wonderful, supportive community! Pati Van Zante has additional comments on the Costume Shop. Coming up this fall, we will be hosting the annual Union Street Players Walk of Fame. Mark your calendars for Saturday, October 8 at Central College. It is my great pleasure to announce that Spence Vermeer will be our honoree for 2016! Congratulations to Spence and we look forward to celebrating with you in October. Let’s finish this meeting with our election of the USP board. I think it’s wonderful to see so many coming back this year with an interest in being involved in our community. I thank all of you who are willing to serve. Union Street Players, Pella’s award-winning community theatre, is excited to announce auditions for our Christmas musical, The Christmas Post. The heart-warming, family friendly musical based on two Norman Rockwell paintings was a huge hit with USP audiences ten years ago. The Christmas Post tells a heartwarming Christmas story set in the postwar years after World War II. A young widow works tirelessly at Herzog’s department store hoping to make enough money to buy Christmas presents for her children. We know that audiences will love to experience the love and laughter of The Christmas Post once again and to introduce the show to a new generation of fans. Director Wendy Vander Well will again take the helm of our production and Kathy Haug returns as the show’s musical director. If you have any questions, please contact Director Wendy Vander Well at wendyvanderwell@gmail.com or 515.326.2661. No experience necessary. No roles precast. There are roles for men and women, boys and girls from ages 10 to 110. Perusal scripts, along with a CD of the soundtrack, are available at the Pella Public Library. All auditions are on the stage of the Joan Kuyper Farver Auditorium in the Pella Community Center, 712 Union St., Pella, Iowa. Union Street Players is saddened to announce that our summer production of Sabrina Fair has been cancelled. Director, and USP President, Cyndi Atkins explained that there were simply not enough people available this summer to fill all fourteen roles on stage and all production roles off stage. Atkins said it was a difficult decision. USP hopes to reschedule Sabrina Fair in a future time slot on the production schedule. We apologize to the few individuals who had auditioned and were looking forward to the show. We hope to provide another opportunity in the future. Almost, Maine is set in the depths of winter on a moonless night in northern Maine. It’s a chilly, snowy setting and much of the cast, costumed by Linda McQuade, spend their time on stage sweating in full winter regalia. It’s one of the many contrasts that playwright John Cariani wove into the magical, heart-warming tales of love and relationships. On Sunday April 17, Union Street Players production of Almost, Maine ended its four show run with a good word-of-mouth crowd who endured unseasonably warm temperatures both outside and inside the Joan Kuyper Farver auditorium. Directed by Kevin McQuade, who made his USP directorial debut, the seven cast members delighted audiences with the script’s nine vignettes which produced both laughter and tears. The ensemble cast was anchored by a number of USP veterans including Spence Ver Meer, Jana De Zwarte, Wendy Vander Well, Tom Vander Well and Sara Collins. Ana Lucia Riegstad was cast in her third straight USP production and Stephanie Lantz made her USP stage debut. Tyler Coleman and Charlee Eekhof provided musical accompaniment between scenes. The show was well managed by Stage Manager Alex Dean, a student at Theatre Central. Pat Moriarity joined the show mid-stream to act as Producer (sadly, his last USP show before he and Peggy move to Arkansas). Arvin Van Zante ran the lights and sound, and Mark Schaefer provided back stage assistance. Mat Kelly designed the minimalist set. Cody Kori assisted with sound effects. Auditions May 10/12 at 6:30 p.m.; May 14 at 9:00 a.m.